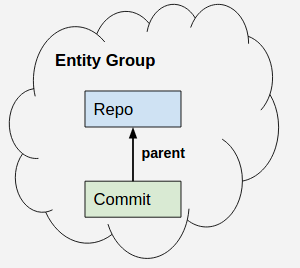 Continuing on my example with repos, commits and files, there are several ways to model entity relationships in Google Cloud Datastore. Entity models don't have relationship attributes and joined at runtime through parent attribute. Entities form entity group. This model provides high consistency but very low write throughput (1 write / second). KeyProperty resembles foreign key in relationship database. In contrast to ancestor path / parent it provides low consistency but high write throughput. Finally there's StructuredProperty to embed one entity to another. This can work in simple cases because Datastore could not provide indexing and retrieval of nested entities. It is also limited to just two levels. Code sample is here as well as NDB reference that I use all the time.